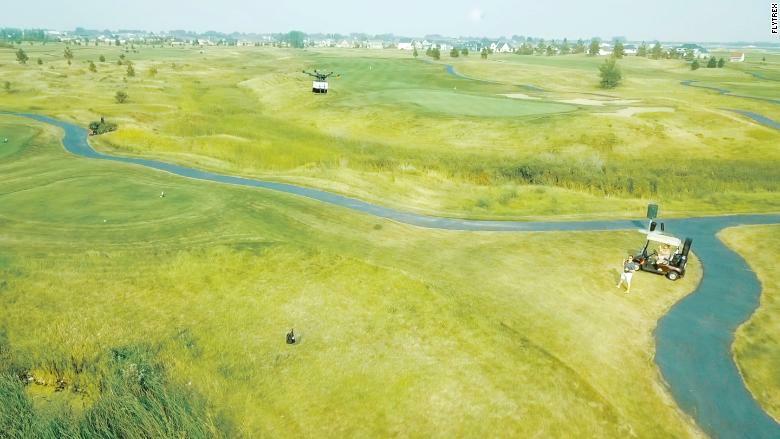 A golf course in a part of North Dakota locals call "Sili-drone Valley" believes it has a solution to declining membership at courses nationwide: Drone deliveries. Beginning Sept. 15, players at King's Walk Golf Course in Grand Forks, North Dakota, will be able to have refreshments delivered to them by drone for just $3. This being 2018, they'll order refreshments via an app, and watch as the drone lowers their snack to them on a rope about 10 minutes later. Like many golf courses, an employee roams the area in a beverage cart. But on busy days, players might wait as long as an hour before having the chance to buy something. Yes, they can duck into the restaurant positioned midway through the 18 holes, but the course and its partners say that's a bit much to ask in today's age of instant gratification. 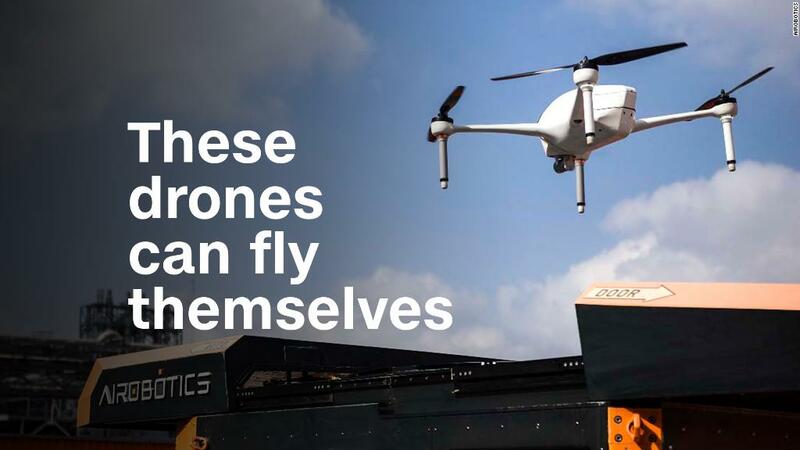 "Wherever you are, you should be able to get what you want within a few minutes," Yariv Bash, CEO of FlyTrex, the Israeil drone logistics startup operating the service, told CNNMoney. "Why wait?" FlyTrex has already made hundreds of automated food deliveries in Iceland this year, and wants to expand. It considers golf courses a natural market, and the added convenience could help reinvigorate a sector that's seen the number of 18-hole US courses decline 7% since 2007. FlyTrex found a willing partner in Grand Forks, a hotbed of drone activity. The local Air Force base focuses on drone missions, and the University of North Dakota was the first university with an undergraduate drone degree. Keith Lund, president and CEO of Grand Forks Region Economic Development Corporation, calls the area "Sili-drone Valley." Since 2008 one of his employees has been focused entirely on developing local drone businesses. Drone delivery remains a rarity in the United States. Regulations generally restrict flying over people, and require operators to keep their aircraft within sight. That makes delivery services impractical in most situations. And automated drones must be monitored by a human, which make the services expensive to operate. Golf courses make it a bit easier, though. The tend to have wide open spaces, few people, and clear sightlines along the links. King's Walk plans to start with a six-week trial run with a single drone making deliveries to a single location. If things go well — and it receive an FAA permit to fly over people — the course expects to add delivery points throughout the course. Bill Palmiscno, executive director of the Grand Forks Park District, which operates the course, can foresee replacing one of the course's beverage carts if the drone tests succeed. Players have had varying reactions to the drone, which weighs about 33 pounds, makes a steady buzzing sound and flies at 30 mph. ""The young golfers think it's great. We've had people already call and ask — when's the drone flying?" Palmiscno told CNNMoney. "The old members kind of think, 'oh you're wasting your money.' "
He's explained to them how much cheaper a drone is when compared to the price of a beverage cart. Palmiscno has also heard from the neighboring softball complex, whose organizers are open to drone deliveries from his course's restaurant. Palmiscno envisions athletes sitting around after a game, drinking beer, and having food dropped from a drone. To prevent being hit by wayward balls, the drone flies at between 200 and 300 feet above the ground. It descends to 45 feet above the ground when lowering a delivery. "If it goes well, this could be great," Palmiscno said.